Let us now investigate another trick for solving Poisson's equation (actually it only solves Laplace's equation). Unfortunately, this method can only be applied in two dimensions. is perfectly well-defined, and is, therefore, completely independent of the details of how the limit is taken in Eq. (748). These are called the Cauchy-Riemann relations, and are, in fact, sufficient to ensure that all possible ways of taking the limit (748) give the same answer. Thus, both and automatically satisfy Laplace's equation in two dimensions; i.e., both and are possible two-dimensional scalar potentials in free space. Thus, the contours of are everywhere perpendicular to the contours of . 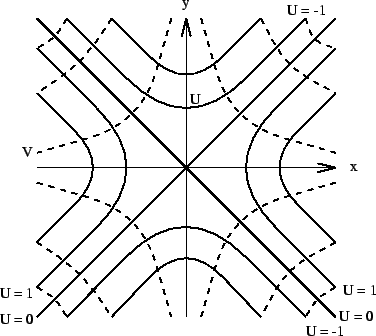 It follows that if maps out the contours of some free space scalar potential then indicates the directions of the associated electric field-lines, and vice versa. Thus, the -component of the electric field is directly proportional to the distance from the -axis. Likewise, for -component of the field is directly proportional to the distance from the -axis. This property can be exploited to make devices (called quadrupole electrostatic lenses) which are useful for focusing particle beams. where , and . Note that zero net charge is induced on the surface. We can think of the set of all possible well-defined complex functions as a reference library of solutions to Laplace's equation in two dimensions. We have only considered a couple of examples, but there are, of course, very many complex functions which generate interesting potentials. For instance, generates the potential around a semi-infinite, thin, grounded, conducting plate placed in an external field, whereas yields the potential outside a grounded, rectangular, conducting corner under similar circumstances.